Public transit users take 30 percent more steps and spend roughly eight more minutes walking each day than drivers. 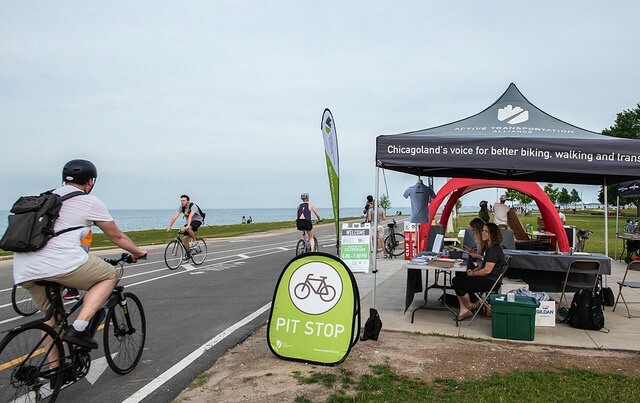 The Active Transportation Alliance compiles a list of events happening each month along the Lakefront Trail. See what’s going on in the month of July so you can better plan your walking, biking or running route. This month will be busy! NOTE: For updates on the Lakefront Trail separation construction, visit the Chicago Park District’s page. A small section of the lakefront trail between Chicago Ave. and Ontario St. has been affected by recent storm damage. The pedestrian portion of the trail in this area is open for both foot and bike traffic. Repairs will be made when weather allows in the spring. Until then the area will be monitored and cleaned up as needed. Construction has begun on the pedestrian section of the Lakefront trail, between Foster and Montrose. During this time, both pedestrian and bike traffic will use the recently completed bike portion of the trail. During construction of the trail section from Ardmore to Foster, there will be no bicycle or pedestrian access. This section will be closed. Click here for the detour map. Reminder, please use caution and slow down in work zones.